In renal allograft recipients, cytomegalovirus (CMV) typically causes tubulointerstitial nephritis. Only rarely glomeruli are involved. We present a rare case of CMV with collapsing glomerulopathy, necrotizing glomerulonephritis, and crescent formation in a renal allograft recipient. Immunohistochemistry confirmed CMV infection. The patient was started on valganciclovir and his renal function remained stable. A repeat renal biopsy performed three months later showed morphologically normal glomeruli and CMV immunostaining was also negative. Nephropathologists have to carefully screen for CMV in cases with crescentic or collapsing glomerulopathy as the later lesions resolve after treating the underlying viral infection. This study will add on to the various glomerular changes associated with CMV infection. Cytomegalovirus (CMV) is a well-recognized cause of tubulointerstitial nephritis in renal allograft recipients. Only rarely is it associated with collapsing glomerulopathy or with necrotizing and crescentic glomerulonephritis. We present this case for the rare association of CMV-induced tubulointerstitial nephritis, collapsing glomerulopathy, and necrotizing glomerulonephritis with cellular crescent formation. A 58-year-old male patient with end-stage renal disease on hemodialysis underwent live donor renal transplantation on October 13, 2016. Triple regimen immunosuppression was given. Both the donor and recipient were CMV immunoglobulin G (IgG) antibody positive and IgM negative. He was discharged on October 22, 2016 under stable conditions. His serum creatinine was 1.1 mg/dl, blood urea nitrogen 17 mg/dl and potassium was 3.7 mEq/L at the time of discharge. Serum creatinine was maintained between 1.3 and 1.4 mg/dl. He had graft dysfunction from December 28, 2016, with serum creatinine of 2.6 mg/dl. Urine routine examination showed 2+ proteinuria with bland urinary sediments. Urine protein creatinine ratio was 2. His hemoglobin was 11.5 mg/dl, total leukocyte count was 4100 cells/cumm and platelet count was 1,70,000/cumm. Liver function test was normal, total protein was 7.0 gm/dl and serum albumin 3.6 gm/dl. Serology for anti-neutrophil cytoplasmic auto-antibodies was negative. Renal biopsy was performed to identify the cause of graft dysfunction. Renal biopsy showed cellular crescent [Figure 1] along with segmental fibrinoid necrosis in one out of the 16 glomeruli. The segmental collapse of the capillary tuft was seen in another glomerulus [Figure 2]. The remaining glomeruli were normocellular with patent capillary loops. In two tubules, markedly enlarged 2–3 epithelial cells were seen with intranuclear and cytoplasmic viral inclusions. Immunohistochemistry (IHC) for CMV (Cell Marque, DDG9/CCH2) was positive over these cells, confirming the diagnosis of CMVnephritis [Figure 3]. C4d, IgG, IgM and IgA and complements C3 and C1q were negative. The diagnosis of CMV with necrotizing glomerulonephritis and cellular crescent was made based on the typical light microscopic and IHC findings. He was treated with valganciclovir (450 mg), cyclosporine, mycophenolate mofetil, and everolimus. The initial CMV polymerase chain reaction (PCR) quantitative assay was 900 copies/ml of blood and after 3 weeks of treatment, it became negative. A repeat biopsy done on July 21, 2017 showed glomeruli which appeared morphologically normal. No viral inclusion bodies were identified. CMV IHC stain was negative on the renal tissue. Three months later, total leukocyte count was 9600 cells/cumm, protein creatinine ratio was 0.8, and the serum creatinine was 1.5 mg/dl. CMV is one of the major viral pathogens complicating renal transplantation. It is a double-stranded DNA virus and belongs to the herpes viridae family. The human herpes virus family is composed of three subfamilies: alpha, beta, and gamma herpes virus. CMV belongs to the beta subfamily. The transmission of CMV occurs through saliva, body fluids, or through tissue. Seroprevalence of CMV in India among voluntary blood donors was 95%. In seronegative individuals, after primary infection, it establishes latency in CD34+ myeloid progenitor cells, CD14+ monocytes, megakaryocytes, and also in dendritic cells. Active viral replication does not occur during latency. When the person becomes immunosuppressed, reactivation of CMV occurs. The characteristic features of herpes viruses are latency and reactivation. Once CMV activation occurs, according to the clinical presentation, it can be CMV infection or CMV disease. 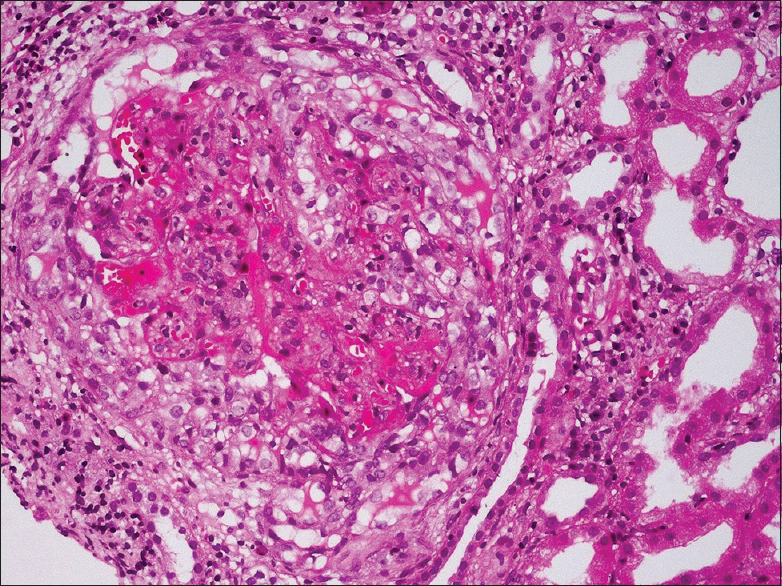 CMV nephritis requires the detection of CMV along with histological features of CMV in a patient who has renal dysfunction. Before transplantation anti-CMV IgG is used as it is more specific than IgM or combined IgG and IgM serologic tests. After transplantation, serology is not used to diagnose active CMV infection. The sensitivity of blood culture to diagnose CMV infection is poor. Viral load testing remains the cornerstone to diagnose and monitor CMV infection and disease. It can be done by pp65 antigenemia or by quantitative nucleic acid testing (QNAT). pp65 antigenemia assays are rapid, but leukocytes from fresh blood are essential as the sensitivity decreases when the blood is processed after six hours. Its performance also decreases when the absolute neutrophil count is lower than 1000/mm 3. QNAT is now the method of choice for diagnosis, preemptive treatment, and also for monitoring response to treatment. It uses DNA and its sensitivity does not decrease with blood storage. PCR-based methods can recognize CMV infection at least a week earlier than pp65 antigen assays. This helps in starting preemptive antiviral therapy. CMV detection in the tissue specimen is the definitive method to diagnose tissue invasive infection, and it should be confirmed by immunostaining or in situ DNA hybridization. The risk of viral infection in transplant recipients is highest in the first few months following transplantation, when the patient is treated with high level of immunosuppressive drugs. CMV disease most often occurs in the first six months post transplantation. Cytopathic changes caused by CMV in the kidney are very focal and are seen in tubular epithelial cell cytoplasm and nucleus. The cells infected by CMV are enlarged, nucleus contains a central inclusion which is surrounded by a halo giving the owl's eye appearance. Occasionally, intranuclear homogeneous, smudgy inclusions are observed. Basophilic, small, lumpy viral inclusions are seen frequently in the cytoplasm of the cells harboring these intranuclear inclusion bodies. Glomerular involvement occurs only rarely. Macaulay Onuigbo et al. in 2002 described a case of CMV glomerulopathy in which there was focal necrosis of the glomerular tuft without any crescent formation. Detwiler et al. in 1998 have published a case report of necrotizing and crescentic glomerulonephritis associated with CMV infection. There are case reports of collapsing glomerulopathy associated with CMV infection. Grover et al. reported a case of collapsing glomerulopathy associated with acute CMV infection in an immunocompetent host. Acute CMV infection was diagnosed based on the elevation of serum CMV DNA antibodies of both IgG and IgM and a high viral load. 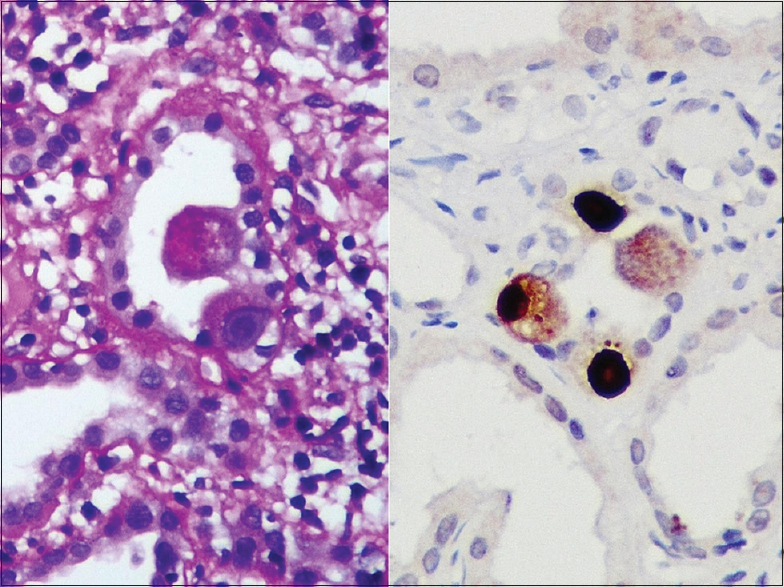 Although there were no CMV inclusions identified in the kidney biopsy by light microscopy and IHC stain, they attributed the etiology of the collapsing glomerulopathy to CMV infection as the patient's renal function improved with antiviral therapy for CMV. In our patient, we were able to demonstrate CMV infecting the kidney on light microscopy and it was confirmed by IHC. There was partial remission of proteinuria and creatinine decreased to 1.5 mg/dl with treatment. Furthermore, a repeat biopsy done after treatment showed no glomerular pathology. CMV IHC staining was negative on the biopsy post treatment. This is also the first case report having both necrotizing glomerulonephritis with cellular crescent and collapsing glomerulopathy associated with CMV infection. T-cell directed adaptive immunity is thought to play a major role in the development of crescentic glomerulonephritis. It has been proposed that viral infections lead to collapsing glomerulopathy due to direct cytopathic effects or by activating immune system. In our case, viral activation of the immune system is speculated to cause both collapsing glomerulopathy and cellular crescent with glomerular tuft necrosis. Ganciclovir, foscarnet, and cidofovir are currently available for treating CMV infection. There are multiple studies showing the efficacy of ganciclovir in prophylaxis and treatment. Foscarnet is nephrotoxic. Experience with cidofovir is limited. Maribavir is also used. Our patient responded well to valganciclovir. 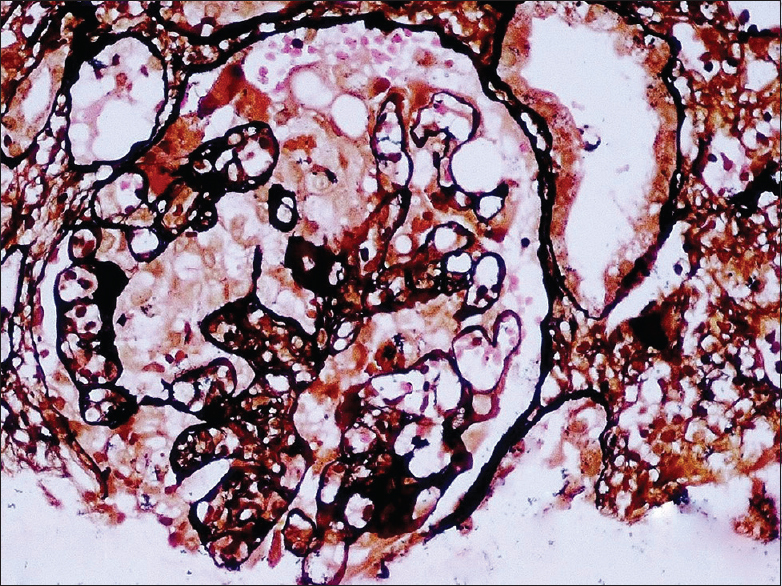 This case highlights the importance of identifying CMV-induced necrotizing and collapsing glomerulonephritis, thereby enabling the appropriate management that would prevent allograft loss. Naraqi S. Cytomegaloviruses. In: Belshe RB, editor. Textbook of Human Virology. 2nd ed. St. Louis: Mosby-Year Book; 1991. p. 889-924. Kothari A, Ramachandran VG, Gupta P, Singh B, Talwar V. Seroprevalence of cytomegalovirus among voluntary blood donors in Delhi, India. J Health PopulNutr 2002;20:348-51. Sinclair J, Sissons P. Latency and reactivation of human cytomegalovirus. J Gen Virol 2006;87:1763-79. Requião-Moura LR, deMatos AC, Pacheco-Silva A. Cytomegalovirus infection in renal transplantation: Clinical aspects, management and the perspectives. Einstein (Sao Paulo) 2015;13:142-8. Farrugia E, Schwab TR. Management and prevention of cytomegalovirus infection after renal transplantation. Mayo ClinProc 1992;67:879-90. Baldanti F, Lilleri D, Gerna G. Monitoring human cytomegalovirus infection in transplant recipients. J ClinVirol 2008;41:237-41. Kotton CN, Kumar D, Caliendo AM, Asberg A, Chou S, Danziger-Isakov L, et al. Updated international consensus guidelines on the management of cytomegalovirus in solid-organ transplantation. Transplantation 2013;96:333-60. Ersan S, Yorukoglu K, Sert M, Atila K, Celik A, Gulcu A, et al. Unusual case of severe late-onset cytomegalovirus-induced hemorrhagic cystitis and ureteritis in a renal transplant patient. Ren Fail 2012;34:247-50. Ulrich W, Schlederer MP, Buxbaum P, Stummvoll H, Rockenschaub S, Kovarik J, et al. The histopathologic identification of CMV infected cells in biopsies of human renal allografts. An evaluation of 100 transplant biopsies by in situ hybridization. Pathol Res Pract 1986;181:739-45. Onuigbo M, Haririan A, Ramos E, Klassen D, Wali R, Drachenberg C, et al. Cytomegalovirus-induced glomerular vasculopathy in renal allografts: A report of two cases. Am J Transplant 2002;2:684-8. Detwiler RK, Singh HK, Bolin P Jr., Jennette JC. Cytomegalovirus-induced necrotizing and crescentic glomerulonephritis in a renal transplant patient. Am J Kidney Dis 1998;32:820-4. Grover V, Gaiki MR, DeVita MV, Schwimmer JA. Cytomegalovirus-induced collapsing focal segmental glomerulosclerosis. Clin Kidney J 2013;6:71-3. Tipping PG, Holdsworth SR. T cells in crescentic glomerulonephritis. J Am SocNephrol 2006;17:1253-63. Albaqumi M, Barisoni L. Current views on collapsing glomerulopathy. J Am SocNephrol 2008;19:1276-81. Chakravarti A, Kashyap B, Matlani M. Cytomegalovirus infection: An Indian perspective. Indian J Med Microbiol 2009;27:3-11.